Water is a fundamental need for all life on earth. While Australia has one of the driest climates on the planet, Australians are also some of the planet’s highest consumers and wasters of water, and that incongruity is directly influenced by how we plan and develop our cities and towns. In conventional residential subdivisions in Australia, water is piped in clean from a centralised source, used and polluted by the residents, and then piped away as a waste product. Rainwater falling naturally on the roofs and roads of the subdivision is drained away (often polluted) to the nearest watercourse or ocean. This all requires extensive infrastructure, enormous amounts of energy, and has a negative environmental impact on the natural water cycle. In a natural ecosystem, water is provided, used and recycled by nature in a seemingly closed loop. At the Witchcliffe Ecovillage, we have modeled management of the water cycle on natural ecosystems, where water is collected, used and cleansed using natural biological systems, and then reused on site. The natural rainfall on our site will be used to sustain the healthy lifestyle of our community, grow our gardens, produce our food, grow timber, sustain our wetland habitats, and maintain the natural pattern of the streamflows that leave our site. Wherever possible, the water management processes will make use of natural flow patterns and biological processes, and provide the energy required to reuse water onsite through renewable energy generation. The Witchcliffe Ecovillage takes a completely integrated approach to managing water resources onsite. From rainwater collection, stormwater treatment, wastewater treatment, water storage, landscape and agricultural irrigation to maintaining natural streamflows and recreating natural habitat for aquatic life – the complete water cycle is managed on site by the community. Households in the Witchcliffe Ecovillage collect and store rainwater from their roof to supply all household water needs. The size of the rainwater tank required to supply your household needs is dependent on rainfall patterns, roof area and the amount of water used. We have used data from the Bureau of Meteorology Witchcliffe weather station, which is located on the Witchcliffe Ecovillage site, together with typical residential water consumption rates to determine recommended tank sizes. 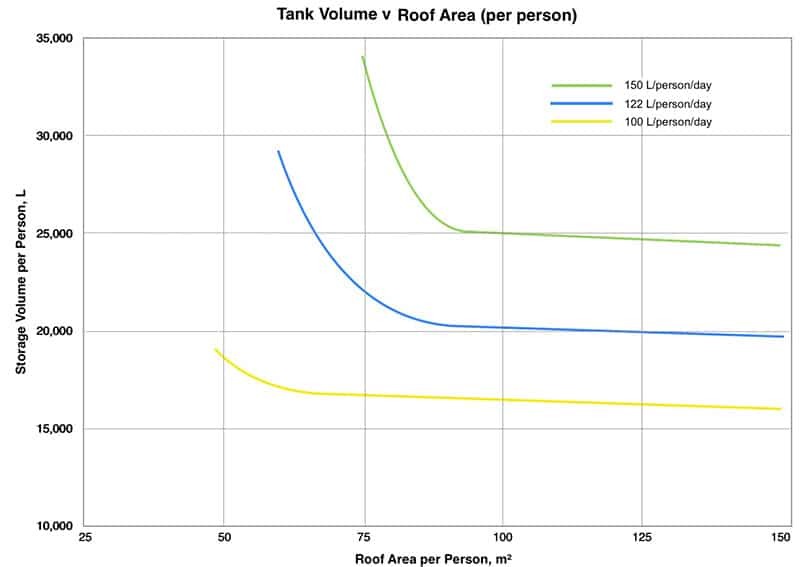 We have calculated tank sizing for consumption ranging from 150 litres per person per day, which is the average indoor use for Perth scheme connection, 122 litres per person per day, which is more representative of a moderately efficient household in Margaret River, through to 100 litres per person per day, which is achievable with AAA rated appliances and efficient household practices. Josh’s House, a model sustainable household in surburban Perth, using readily available water efficient technologies and water aware lifestyle changes, has reduced water consumption to less than 100 litres per person. We have also allowed a 10% reduction in rainfall below the lowest rainfall years on record to allow for effects of climate change and a further 10% for rainfall losses such as from first flush diverters. The following diagram shows minimum recommended tank sizes for Witchcliffe for storage of all household water needs. The tank sizes are based on water use of between 100L/person/day (water efficient household) and 150L/person/day (Perth average household). The recommended tank sizes do not include any allowance for watering gardens and lawns. 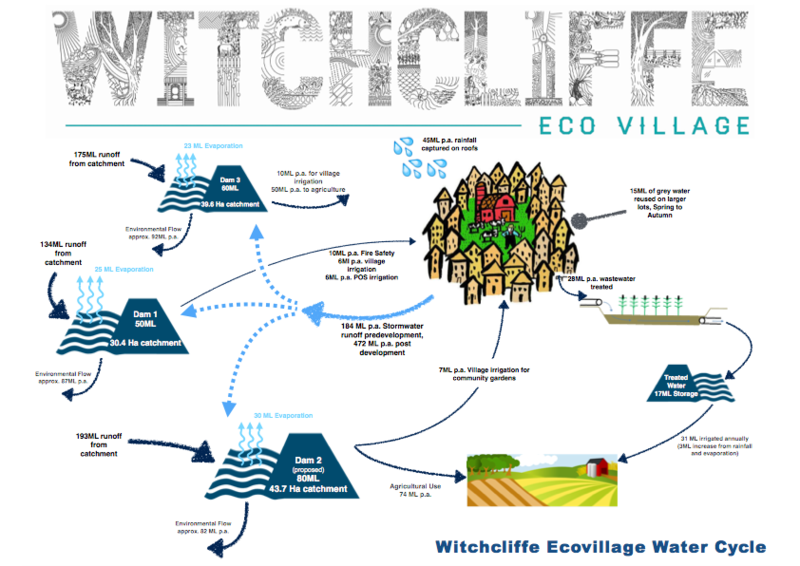 Every household in the Witchcliffe Ecovillage will be provided with a connection to the village wastewater treatment system. The wastewater treatment system is designed around a modular bioreactor that can be upgraded as the Ecovillage grows. The system comprises screening, treatment in a bioreactor to remove nutrient and organic matter, a lagoon to store water for seasonal use, and re-use of treated water for horticulture. Treated water will not be supplied back to households or community gardens at the Witchcliffe Ecovillage because using the Ecovillage dams to capture and reuse stormwater provides a more efficient and cost-effective solution for garden irrigation. Residents are also encouraged to install domestic grey water recycling systems to enable water from bathrooms and laundry to be reused to water gardens on their own lots. This will allow up to 60% of household water consumption to be reused at the source during the drier months of the year. Providing storage of treated water in a small lined lagoon maximises the availability of the treated water for horticultural irrigation in summer when it is required and avoids the need for dispersal of treated water when the soil is already saturated from rainfall in winter. Treated water will be irrigated on a productive tree plantation located at the south of the Ecovillage site, which will surround the treatment plant and provide a buffer to residential areas. Tree crops will be included in the plantation including eucalypts to provide mulch for the village gardens and avocados for their higher water and nutrient demand to maximise the recycling of nutrients as well as water. The Department of Health oversees the management of recycled water to ensure that the highest health standards are met. Stormwater runoff in a natural ecosystem is intercepted by tree canopies, the plant understory, and the mulch layer, which slows the water moving through the ecosystem, increasing absorption of the water by the soil, and maximising the water available for transpiration. In an urban environment, water runs off hard surfaces such as roads, driveways, paths and roofs quickly with very little absorption. Landscaping in an urban area slows down runoff and increases infiltration, but usually not as effectively as a natural system. Stormwater in the Witchcliffe Ecovillage will be collected and conveyed in surface water features that have been created to mimic natural ponds and streams. Run off from roads will be collected in swales, which provide biofiltration to remove pollutants, and will be directed via reconstructed streamlines through the community gardens where further treatment areas incorporating biofilters, riffle and wetlands will provide additional cleansing. Treated stormwater collected and stored in dams will be used for irrigating community gardens, recreation areas, landscaping and agriculture throughout the Ecovillage. The stormwater system departs from the traditional urban approach of hiding stormwater underground in concrete pits and pipes, instead using a system that mimics natural water flows, slowing the speed of water flow, integrating with the village gardens and landscaping to provide habitat for aquatic life and utilising natural systems to cleanse and restore stormwater quality before entering water storages and streams downstream from the Ecovillage. 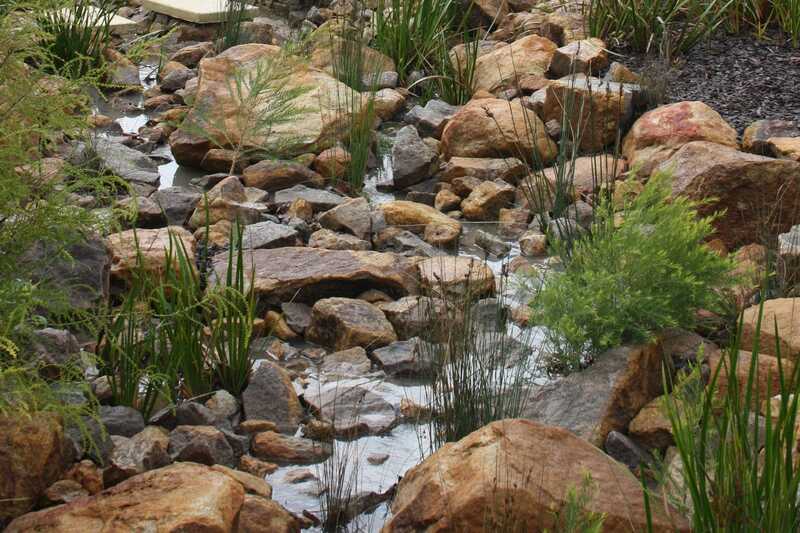 Stormwater at the Margaret River Shire Offices in a reconstructed stream with native landscaping. In climates with dry summers, water is essential to maintain public open spaces and to grow many agricultural crops. The Witchcliffe Ecovillage open spaces will feature water sensitive landscape design. However, the productive landscapes, community gardens and agriculture plots will require irrigation through the summer months. At the Witchcliffe Ecovillage, water is supplied from dam storages within the Ecovillage for landscape and agricultural use. 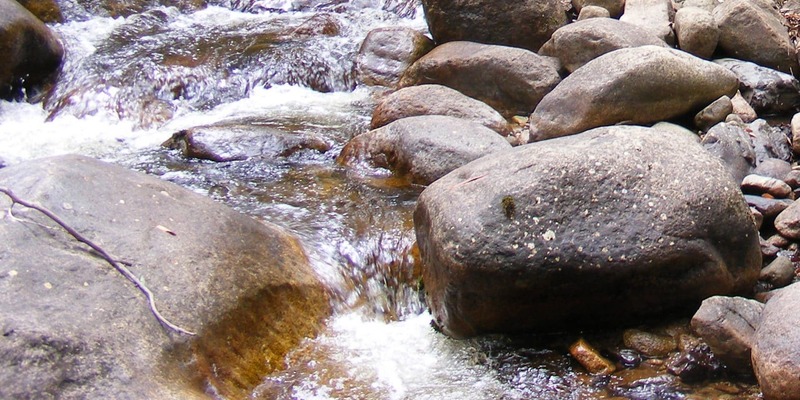 Our dams have been designed to be highly sustainable, with the volume of water stored and used from dams offset by the increased stormwater runoff created by the Ecovillage’s roads, rooftops and footpaths, and low flow bypass pipes fitted to ensure minimal impact on natural stream flows downstream. Water from the dams will be pumped using a solar pump to a tank in each community garden where it can be used for irrigating vegetable gardens and landscaping, providing water to chickens and keeping the community aquaponic systems filled. A water supply is also provided to each of the 17 agriculture lots around the periphery of the village, with a water allowance of 5000 kL/Ha/year for each general agriculture/horticulture lot and an allowance of 1000kL/Ha for the vineyard. When land is developed for urban and agricultural use, the volume and peak flows from stormwater runoff increase. The Witchcliffe Ecovillage uses dam storages to capture these increased flows, thus enabling development to occur and production of food onsite while minimising the impact of natural stream flows downstream. A bypass pipe is provided for each dam that diverts the flows around the dams to ensure the environmental flows are provided first. When runoff increases with heavier rainfall events, flows exceed the capacity of the bypass pipe and are captured by the dam.